The bazaar is bustling: it's the big day at the rug market! The best salesperson will soon be named! Each player is a salesperson who tries to outwit the others. Each player takes it in turns to throw the dice and then move Assam, the market organizer. If Assam stops on an opponent's rug, the salesperson must make a payment to its owner before putting one of their own rugs on an adjoining space. When the last rug has been laid, the total number of visible rugs and the number owned by each salesperson are added up: the best player wins! 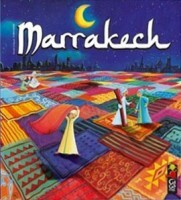 Marrakech is a simple fast paced economic board game about rug bazaar in Marrakech. A very cool thing about this game is using rug shape pieces of textile instead of cards. While there is no need to shuffle these rugs, the material fairly corresponds the theme. Depending on number of players you may have around 15 rugs of a same color in stock. Coins: Wooden coin chips. these chips are very well fabricated. You have some initial wealth. You earn and pay them during the game play. All you need to do is to represent your rugs on the board to Assam. -Move Assam. Assam is the only moving token on the board which every one move it on their turn. If Assam ends in some other player’s observable rug; you need to pay as many coins as connected observable rug tiles of his color to him. Game Ends: when every one played their rugs then who has the higher summation of remaining coins and observable rugs on the board wins. Marrakech is a good looking filler game. Components are simple but creatively designed and correspond the game theme and its simple mechanic. If you like Tsuro you may like this game too. I like Marrakech. It is a game that looks so simple, and is simple, you wonder what the “catch” is. You lay you rugs down on the board and move the little guy around the spaces. If the guy lands on your opponent’s rug during your turn, you need to pay your opponent. Sounds simple- right? Let me tell you, I thought I was winning by a landslide, then, about halfway through the game I got stomped on. My opponent was busy laying down his rugs right next to each other on the far side of the board. I just figured I would avoid that section of the board and be home free. Not so! He turned Assam around and all of a sudden I was stuck in enemy territory! Then my opponent (who always carefully reads the fine print) informed me that I needed to pay him for all of the visible rugs that also TOUCHED the space I landed on. Well, as you can imagine- there were a lot of rugs touching the one I landed on! By the time I caught on to this and tried to catch up by using his strategy, it was too late for me. 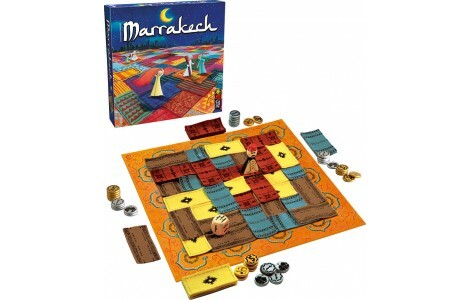 Marrakech is a game that is easy to learn, but takes a couple of tries to master. For me- that makes it a game that I am always willing to play! Typically I do not like games that rely heavily on luck (oh no, what number will I roll? ), but this one has a strategic component that makes up for the chance factor. Add a Review for "Marrakech"